Ronaldo celebrates in front of Atletico fans. The former Real Madrid and Manchester United star will learn his fate after the Uefa Control, Ethics and Disciplinary Body meet this Thursday 21 March. Email “Ronaldo charged by Uefa after Atletico celebration”. 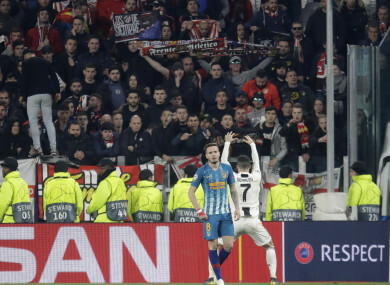 Feedback on “Ronaldo charged by Uefa after Atletico celebration”.